It appears EA and Microsoft have been paying attention to Netflix and PlayStation Now (which opens its doors to all PS4 owners in two days), and are combining to offer a different subscription service for gamers. The EA Access pass is available (currently in beta) for $5/£4 per month or $30/£20 per year and gives subscribers unlimited access to a "Vault" of games. Right now that list covers FIFA 14, Madden NFL 25, Peggle 2 and Battlefield 4, with the promise of more titles soon. Not enticed by the promise of last year's games plus 10 percent discounts on EA games, DLC, and in-game currency? They're also adding in early access trials for this year's round of EA sports games (Madden, NHL, NBA Live, FIFA) and Dragon Age: Inquisition that open up five days before the games go on sale and let your progress carry over to the retail version. EA Access passes will be sold on Xbox Live, in GameStop stores, EB Games in Canada, and online for European gamers via GameStop and Amazon. You can hit the website for details, and EA says it will become available for everyone on Xbox One "soon." Considering the discounts, if you were already planning on picking up a sports game or two this fall, the pricing doesn't seem particularly outrageous, although we will be interested to see what rotates through the "evolving" list of vault games. So, on a scale from Horse Armor DLC to Sim City 4, how excited is everyone about this? 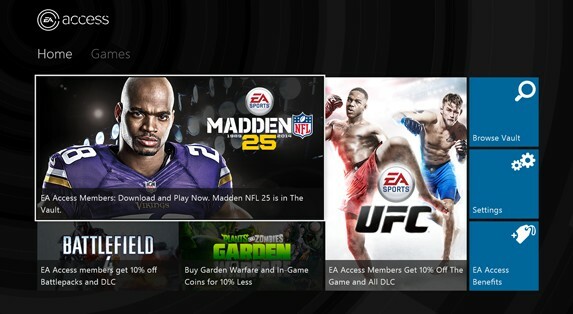 Awesome new way to play more @EA games coming to players on @Xbox http://t.co/XbBzfr2QzE. Great to have @GameStop on board as well!